If you’ve been an iPhone user for years, switching over to Android can be quite daunting as it’s a fairly different mobile OS. Fear not – it’s also a very usable one and while you might find that some adjustment is required, it’s also an exciting change for many who want something a little different. It used to be tough to get people to change from iOS to anything else, but now people tend to move between the two platforms fairly regularly and have worked out some very efficient ways of doing so. The main difficulty for many lies within transferring the data you want and need on your current device to the new one. Luckily, there are some very efficient ways to do so. PC Pro makes a smart recommendation of setting up Dropbox on both your iPhone and the Samsung Galaxy S4, so you can just drop all your files into the cloud-synced wonder app and watch them appear not long after on the other device, ready to be used. This works really well with photos, and especially for phones that don’t have removable memory as it solves the obstacle of physically removing files from one device only to realise the other doesn’t have a slot to plug it into. In terms of apps, both markets are strong enough now that you’ll either find an app you currently use for Android, or there’ll be an app that does the same job available on the Google Play Store. It’s pretty convenient and showcases how far Android has come, to stand shoulder-to-shoulder with the wealth of choice available on iOS. Just remember that if the app has no login or remotely stored data, you’re going to have to start again from scratch – but this is rarely an issue. Transferring your contacts couldn’t be simpler, either, as you can either export them very simply, actually attach and email them over or even be completely rebellious and get out a pen and paper to do things old-school. It’ll only take a little while either way, and if you do it the old way you’ll also have a near-permanent hard copy of all of your contacts for whenever you may find yourself in need of them. You’ll also need to be smart about music. Personally, I use Spotify Premium, which means all of my songs come through that service. What this in turn means is that whenever I change handsets, my online and offline playlists appear immediately after logging in, regardless of OS, and I can get on with nodding my head all day to a lovely selection of music without worrying about formats. If you do however have a locally stored music collection, simply use your backups and convert from format to format if you need to – it’s a lot more straightforward than it looks. Once all that’s done, there’s very little else to worry about, other than what case to buy, what background to use, and of course the all important choice of whether to go for an impressive ringtone or stick with “old reliable” – the vibrate alone. This entry was posted in Communication and tagged Android, Apple, galaxy s4, iPhone, Samsung on April 11, 2013 by Reese Jones. Which phone is the most valuable and worth to receive RM 200 smartphone rebate ? Of course there is no standard answer. But if you ask me, I would say iPhone 5. Why ? 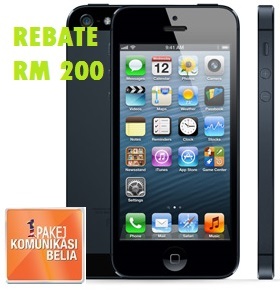 From my point of view, Apple iPhone is the most valuable and worth to own it with RM 200 smartphone rebate, because Apple has fixed the price and their reseller can’t advertise lower than their recommended retail pricing (RRP), so you won’t find anywhere that selling cheaper than Apple retail price. And iPhone price will only reduced after the introduction of the next generation iPhone. For example iPhone 4S dropped from RM 2,199 to RM 1,799. Unlike the other smartphones, like Samsung Galaxy Note 2, RRP is RM 2,299, after smartphone rebate is RM 2,099, but my friend bought it somewhere even lower than RM 2,099 without smartphone rebate. This entry was posted in Communication and tagged Apple, iPhone 5, rebate, SKMM, smartphone on March 5, 2013 by RMvalues. Cheapest Contract Free iPhone 5 Plan ? Finally iPhone 5 launched in Malaysia last Friday, and Apple Online Store Malaysia also began to sell iPhone 5 (GSM Unlocked) without contract for those who prefer not to sign up either a 12 months or 24 months contract with Celcom, DiGi and Maxis. I would say one of the main purpose of owning an iPhone 5 is to use data service. If an expensive smartphone like iPhone 5 has no data plan, that’s not only ridiculous, but also a waste, even you’re so rich. Therefore in my comparison chart of the prepaid and postpaid plans, I may not include those pricing are higher than contracted iPhone 5 packages. This entry was posted in Communication and tagged Apple, Cheapest Prepaid, iPhone 5, TuneTalk, U Mobile on December 17, 2012 by RMvalues.